Like all horses, the draught horse is herbivorous. To easily differentiate between ‘light' horses and draught horses, all we need to do is observe them and/or confirm how much man has used them. 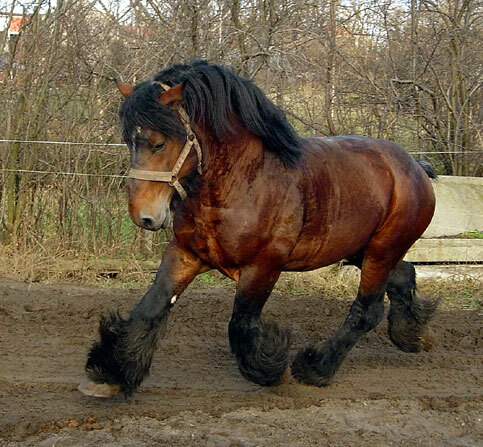 Contrary to the ‘light' horse, the draught horse is not used for equitation but for work, because of this, it's a big, strong, heavy, placid animal. It's height is generally between 150 and 185 centimetres and it's weight varies between 500 and 1,200 kgs. The mare's gestation period lasts about 11 months and it gives birth to a single foal that can walk within one or a few hours after that. The life span of a draught horse is between 20 and 30 years. There are several draught horse races such as the American Cream Draft, the Ardennais, the Brabançon, the Dales, the Fjord, the Franches-Montagnes, the Frison, the Gypsy Vanner, the jutland, the Oberlander, the Percheron, the Shire, the Suffolk, etc. Which services has it provided to man? For millennia, draught horses have put their power and docility at the service of man. In the past, it was the peasant's tractor, it was a chariot or cart engine, it provided haulage strength, it served as a railway locomotive, etc. then mechanisation arrived and the use of draught horses progressively reduced in rich countries. Except for the butchery; it was raised essentially with this in mind. But the consumption of horse meat has reduced progressively; more and more people refuse to eat horse meat. Does the Draught Horse have a future? In countries in which it continues to be used (Developing countries), of course. In Africa, it is more economical to use a draught horse than a tractor. In rich countries, the ecological crisis we are going through is paradoxically ‘good' news for draught horses, because it underlines their exceptional qualities and the advantages it naturally possesses in the fight against the degradation of the environment. Biological agriculture which is developing fast is particularly one of the sectors in which their number has increased, because apart from their capacity to go through inaccessible places compared to machines, they do not compact the soil or make it collapse. Finally, in all the activities linked to eco-tourism, draught horses can be used; children as well as adults are naturally drawn to these animals.